Schnepper: Praising ASA’s strength... our members! - AutoInc. Schnepper: Praising ASA’s strength… our members! Happy New Year! I hope your holidays were filled with family, friends and fun. Last year was a time of change for the Automotive Service Association (ASA), and those changes continue. We welcomed Dana, Ben and Ashley (see page 4) to the ASA family and finished 2017 with a successful and productive Affiliate Conference to improve our processes and strengthen the bonds between us. We also ensured that all ASA members had a seat at the table in Washington as our industry charts the path forward with new technologies and challenges from autonomous vehicle development to issues surrounding telematics and cybersecurity. Through it all, it was the support and participation of our member volunteers that once again demonstrated the value and strength of your association to our industry. What’s ahead for 2018 presents both challenge and opportunity as we focus our efforts on growing ASA. We continue to work hard on your behalf and have laid the groundwork for the next evolution of our organization. Working with our Affiliates, we are launching a drive to find the best-of-the-best shops and people to join and help grow the membership of ASA so our voices will be heard even louder in Washington and state legislatures across our nation. To achieve these goals, we need your help. ASA members are our best ambassadors to help identify and recruit those who represent the future of our industry. Through participation in our Chairman’s Club, you can bring new voices to the table and help ASA address the changing needs and priorities of the next generation of automotive professionals. You’ll be hearing more about this in the days and months to come at chapter meetings, in the pages of AutoInc. and through our social media efforts. 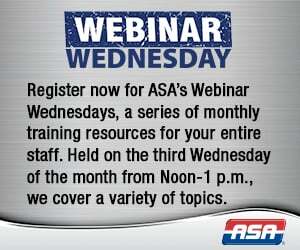 I hope you’ll join us in helping to take ASA to the next level! As we enter the New Year, I’d also like to take this opportunity to thank each and every one of you for your support of the ASA board and staff. As I’ve said before, it’s the membership of ASA that represents the true strength of your association. If it’s true that the future is determined by those who show up, our industry is in good hands with such dedicated professionals as our members, who have demonstrated their willingness to get involved and make a difference. 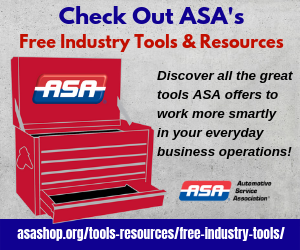 ASA was created to represent all of the hardworking men and women who make the automotive service and collision repair industries one of the pillars of the U.S. economy. With your ongoing help and support, ASA will be there to look out for your best interests. Here’s to another successful year!